In January, we launched a Copyblogger Content Challenge mini course. It was designed to help you understand, build, and improve cornerstone content pages. The response was immense: Almost 4,000 people signed up and in just a couple days the forum was bristling with people posting questions, comments, and replies. We were throwing back the jitter juice morning, noon, and night to stay on top of all the activity. Now, one of the original reasons for launching this program was to teach the importance of cornerstone content pages. And one of the most common questions that popped up on day two of this mini course was: what’s the difference between a cornerstone content page and a blog post? Great question, and fortunately, it’s pretty easy to answer with a simple illustration. But we need to deal with another issue first. Yes, it matters, Mr. and Ms. Content Marketer! Let me explain. Content management platforms, like WordPress or our handy more-power-less-hassle Rainmaker Platform, make publishing content on the web pretty darn easy. And they give you a lot of options. As you can see, publishing a page or post is pretty straightforward. Just choose “New” in either case, and start writing. Conventional advice says that your About, Contact, and Portfolio content should be created as pages. And conventional advice also says that blog posts should be created as posts. So far so good? Okay, good. But which one should you choose when creating cornerstone content — a page or post? The answer is: you should choose a page. But why can’t you publish cornerstone content as posts? As Mary Jaksch, Editor-in-Chief of Write to Done, pointed out in one of our Content Challenge discussions: there is no SEO advantage of one option over the other. Pages are not part of the blog stream. They are static and will never get pushed down a stream when you publish new blog posts — making them difficult to find. Instead, you can put pages on display in your sidebar, navigation menu, or both. Pages do not have dates. Because cornerstone content is typically evergreen (always essential), it should appear timeless. Blog posts typically display the date they were published and the content may become outdated over time. In other words, cornerstone pages are a convenient, simple way to organize your content. Pages are static, essential content, while posts are fluid and fugacious. By the way, here’s a headshot of Jerome Vaporlove, my black pound cat, for anyone who knows what fugacious means. Cornerstone content is basic, essential, indispensable, and the chief foundation upon which your content marketing is constructed or developed. It’s what people need to know to make use of your website and do business with you. A cornerstone content page directs visitors to other articles on your website via links. Those other articles are typically blog posts. They support a general topic you write about (the category) and dive into specifics (based on keyword phrases) about the topic. Think of the category term as the hub, and the keyword phrases as the spokes that radiate around the hub. The cornerstone content page would be the category in the hub, and the blog posts would be built around the keyword phrases. The middle part is the cornerstone content page, and blog posts radiate around it. Like a wheel. In the illustration above, there are 14 spokes. The number of spokes you will have depends upon the content you have on your website. In addition, some people create the cornerstone content page first and then write the supporting blog posts second. Others write all of the articles first, and then reference them in a cornerstone content page afterward. Neither approach is better than the other — it’s your choice, depending on what works best for you. What’s important is that the cornerstone content page is a page, not a post. One way to use cornerstone pages is to make them a “resource page” that contains links to other content on your website. Pamela Wilson’s site, Big Brand System, has a simple cornerstone content page about branding with color. Pamela shares a little bit of content, a resource, and then links to blog posts she’s written on the topic. Here’s the thing: if you use your cornerstone content page as a “holding place” for other content, you can still write about the topic frequently in your blog posts — just always approach the topic from a slightly different angle. At the bottom of the page, Pamela has a call to action (which is important!) to a product she offers that helps people pick their colors. Note that the call to action could have been a prompt to sign up for an email list instead. You just need to direct visitors to the action you want them to take. Are we clear about the difference between a cornerstone content page and a blog post? Does that wheel illustration simplify things? Do you understand why cornerstone content should be a page and not a post? And does all this talk of cornerstone content pages make you zealous to get out there and start publishing those pages? Next article: Is Social Media Making Us Dumb? I thought you did away with comments… and now they’re back? If I missed an explanation of this, can you please point me to it? Thanks. You bet Michael. Glad you found it useful. Hey Damien, I think I should get something for providing the definition of fugacious. And on another note, I wouldn’t suggest using this in content creation as it may affect your Flesch Reading Score. Great post and insight and thanks for providing it. Have a great week! 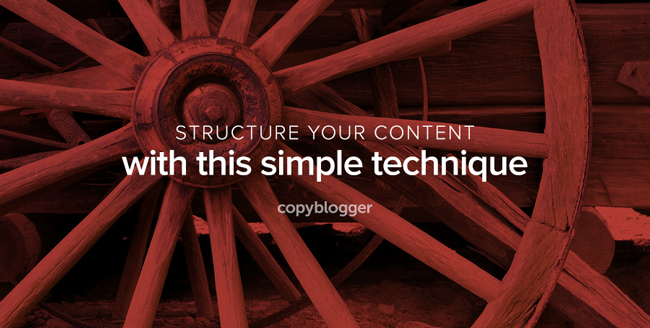 One thing that adds to the confusion is Copyblogger’s cornerstone content pages. They no longer link to blog posts. Instead they blog posts are collected as a ebook. In my opinion a great cornerstone content page should be pointed to from your other blog posts as often as possible. It’s less important that they point out. Indeed, pointing links to it is important, too. Hi Damien, thanks for the informative post. it’s all new to me, but I get the concept. The way I see it, a cornerstone content page is almost an ‘introduction’ to a post category; or a nice way to summarize the category and point to posts relating to the different aspects of that category. If that’s the case – and using the Big Brand System example – couldn’t you create a series of cornerstone content pages around different aspects of branding? Or do you only create a cornerstone content page when you have a related product you want to promote? Hey Mel, no, you don’t need a product to promote. Your cornerstone content page call to action to be to sign up for an email newsletter … or just create the page to dominate a keyword category (like branding) in the search rankings. Wow, I never thought of making a cornerstone post a page. I’m a tech entrepreneur but we started an startup blog and it seems like there is a lot to learn. Thanks for this article! It’s also totally fine to change a post into a page as time goes by, if you have something that was created as a post but seems to have a lot of interest and ongoing value. Leave the hyperlink the same so you don’t break incoming links. Great post Demian. Until now I have never really considered putting together cornerstone pages. It makes so much more sense to create them as static pages instead of hiding them as blog posts. I love the sense of humor you injected into the post too. Thanks Matt, glad you enjoyed. Let me know if you have any more questions. Hi Demian, I am trying to get the concept here. So what I understood about cornerstone page is a kind of hub for all related posts. Or I would say its a kind of category page which used to hold links to posts with in that category. If this is true then we are just creating a static cornerstone page rather than a category. Due to it’s static nature it will be visible every time. Am I going right way or missing something? Love the wheel image. I can vouch that cornerstone content as a page works. That’s how my main blog gained traction, by following the Copyblogger way. What are your thoughts on using a category page as a cornerstone page? Especially now Genesis enables us to add full HTML content on the category pages. I’ve seen positive results when testing this technique but also see the benefit of using a page. Hey Nate, I’m not a fan of that because of the slug (/category/keyword phrase) and the lay out of the related articles is wonky. Not a good user experience. Great visual for why cornerstone content matters. I like the explanation about pages too. You can see the benefits of cornerstone content in many ways from improved SEO, increased conversions, better PR opportunities, and clearer branding. Indeed, there are many benefits, Seth. Thanks for stopping by. Jerome Vaporlove is the page and his frisky whiskers are the posts. His tail’s his CTA. Great explanation. I get it. One question though. How do you sleep at night with Jerome in the house stalking prey? Thanks for this explanation about cornerstone content. I am still going over the class materials from January. I always look forward to reading your posts here and on your blog.